A TV screen shows file footage of President Trump and North Korean leader Kim Jong Un during a news program seen at the Seoul Railway Station in Seoul, South Korea, Wednesday. During Trump's State of the Union address, he announced that the second summit with the North Korean leader will take place this month. "Trump overstates the concerns of 'a major war' had he not been elected," NPR correspondents Scott Horsley and Michele Kelemen wrote in NPR's fact check of the speech. "He ratcheted up the rhetoric about 'Little Rocket Man' at the start of his administration, threatening 'fire and fury' should North Korea attack the U.S."
"This is a very charged claim, even for Trump," Politico's Foreign Affairs Correspondent Nahal Toosi said. Trump "seems to suggest it's his personal existence that's stopping a war," she said, noting it's possible he might use this as campaign spin for 2020. The choice of Vietnam as a meeting place for the second summit could highlight a path forward for North Korea, The Washington Post said. Vietnam's "business-oriented, authoritarian government and successful mix of trade and tourism" could encourage Kim to "choose a bright economic future over nuclear weapons." Vietnam is "a socialist country but one that has a good relationship with the United States and other Democratic countries," Ernest Bower, who runs a consulting firm focusing on Southeast Asia, told the Post. "They serve as a nonthreatening bridge between two ideologies, and they have an open and decent relationship with North Korea." 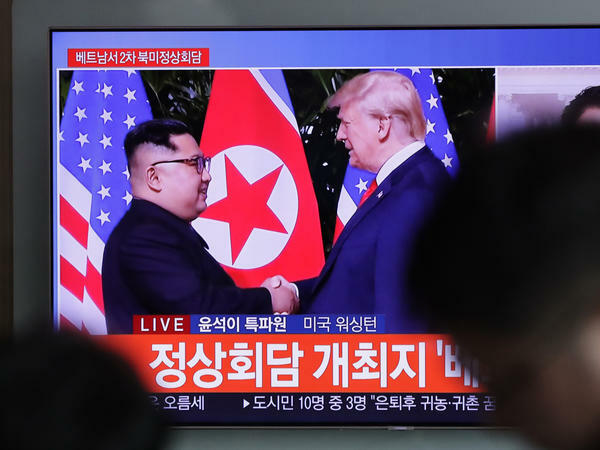 U.S. defense officials at a hearing before Congress last week said that North Korea is unlikely to give up its nuclear weapons. Dan Coats, director of national intelligence, told lawmakers that North Korea is engaging in "some activity that is inconsistent with full denuclearization," The New York Times reported. North Korea's leaders "ultimately view nuclear weapons as critical to survival," he said, summarizing findings in his office's "Worldwide Threat Assessment." U.S. Special Representative for North Korea Stephen Biegun said last week that Pyongyang had promised in October that it would destroy all of its plutonium and uranium enrichment facilities, NPR reported. However, according to Biegun's prepared remarks, the U.S. is "farther away than ever before" from the goal of fully verified North Korean denuclearization. Biegun warned that the U.S. had "contingencies" should the diplomatic process with North Korea fail.